You can find a lot of La Quinta golf deals, but the courses a PGA West offer a world class golfing experience at prices comparable to much lesser courses. The PGA WEST Jack Nicklaus Tournament Course in La Quinta, Ca. is a course that offers value and is very much the signature course of it's namesake. This is a well designed desert course just outside Palm Springs. The legendary Jack Nicklaus developed this course in 1987. He made this course long (7,204 yards from the black tees) and difficult (course rating of 75.3 and a slope of 143). The PGA WEST Jack Nicklaus Tournament Course is 18 holes (par 72) of beautiful Bermuda grass integrated with the natural desert habitat. The course is defined by it's wide fairways and unforgiving greens. The greens are well guarded by water and/or large traps. There are two island greens and most of the greens are undulating. 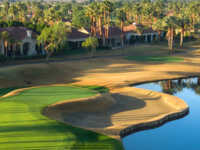 PGA WEST Jack Nicklaus Tournament Course tee times are in high demand during the winter months. As with most La Quinta tee times, reservations are available online. This course shares the full practice facility and clubhouse (including pro shop) with the Stadium Course. Club and cart rental are available. Players fear the rough and enjoy the challenge of the crazy greens. Not a place for beginners or faint of heart.